Monday musings on Australian literature: Whither Australian literature in 1927? Last week’s Monday Musings focused on a plebiscite conducted in 1927 on Australian and New Zealand authors and poets. It was conducted in August as a lead up to September’s Australasian Authors’ Week. I found several articles about this week. Some were primarily descriptive, but a few took the opportunity to comment on the state of Australian literature. We hardly know whether the Australian* Authors’ Week, proclaimed by the Booksellers’ Association, to begin to-morrow, is intended as a tribute to the merits of Australian writers, or as a demonstration of remorse, or as merely a gesture, like the Shopkeepers’ ‘Country Week,’ to indicate the stuff that is to be avoided for the other 51 weeks of the year. Hmmm … this writer continues that it’s not a very original idea, but may divert “the minds of book readers from the notion that Ethel M. Dell, Zane Grey and H.G. Wells are the pillars of the present day literature in the English language and its American offshoot”. I wonder if that “American offshoot” comment is a dig at the language or reflects a prevailing view of the period that they are separate? I’ve never heard of Ethel M. Dell but the Zane Grey comment makes sense. However, I was surprised by H.G. Wells. Maybe his star has risen in the years since 1927? The writer argues against the view that “Australian literature has been an unconscionably long time developing”. S/he suggests that Australia was still a very young country (in terms of white settlement, as we moderns would qualify), at just 14o years old – and that it did not have a significant population for the first half of that period, that is, not until the gold rush of the 1850s. S/he argues that there was little or no American literature for its first 300 years. Hmm … I guess this depends a bit on your definition of “literature”. Later in the article, s/he says that most people narrow the term to “poetry and fiction”, but clearly believes it can encompass more, including history and essays. There was, in any event, political and religious writing in America from its early days but, according to Wikipedia, the first American novels didn’t appear until the late 18th to early 19th centuries. In Australia, the earliest writings were journals of the early Governors; verses by Judge Barron Field; “the superficial historical work of W.C. Wentworth, an Australian native”; and “dry-as-dust chronicles” by historians. Australia’s bookstalls now, s/he writes, “are flooded with the cheap trash of England and America, which are neither literary nor instructive”. The writer then discusses the plebiscite. S/he states that “it would be too much to expect that such a vote could be considered critical”. “Subconsciously, many honest voters would follow the crowd”, s/he suggests. Very likely, I’d say, given that members of the sponsoring Society had provided their selections in the newspaper at the start of the plebiscite! The writer is not particularly keen on the poet who “won” the plebiscite, Adam Lindsay Gordon, and who, s/he says “had an affection for the ‘gee gees'”. S/he also doesn’t approve of the leader of the prose section, Marcus Clarke, with “his inartistic stuff”, but doesn’t explain this further. Another writer on the week, in The Australasian, reports that Percival Serle**, addressing the Australian Literature Society, said that “the worship of Gordon had done a very great harm to Australian literature”, and that English lecturer F. Sinclaire was similarly critical of Gordon, calling him “pernicious as an influence socially and artistically, besides being in no sense Australian”. Back now, though, to our Catholic Press writer who argues that “much of Australian literature prior to the so-called ‘Bulletin‘ school has little distinctive character”. S/he suggests that writers like Gordon, Clarke, Rosa Praed, Guy Boothby “may have laid plots in Australia, but failed to get the atmosphere”. I wish s/he’d elaborated a bit more on this, because s/he goes on to name writers s/he sees as “Australian” without defining what s/he means. Who are they? Well, they include poets Roderic Quinn, Charles Harpur (who wrote “the first genuine Australian verse”), and Henry Kendall. S/he does have a little dig at Kendall’s style – quoting his “notes that unto other lyres belong” – but argues that he is “Australian in sentiment”. Other writers – poets and novelists – s/he names include Rolf Boldrewood, “Banjo” Paterson, Mary Gilmore, Ethel Turner, CJ Dennis, Bernard O’Dowd, Dorothea Mackellar. (F. Sinclaire also names O’Dowd, but adds Furnley Morris***, whom I don’t know at all, and J. Shaw Nielson). As an aside, I can report that all the poets mentioned here – including the maligned Gordon – appear in 100 Australian poems you need to know, published in 2009. It’s not the arbiter of quality, but is a fair indication of the longevity of these writers’ reputations. 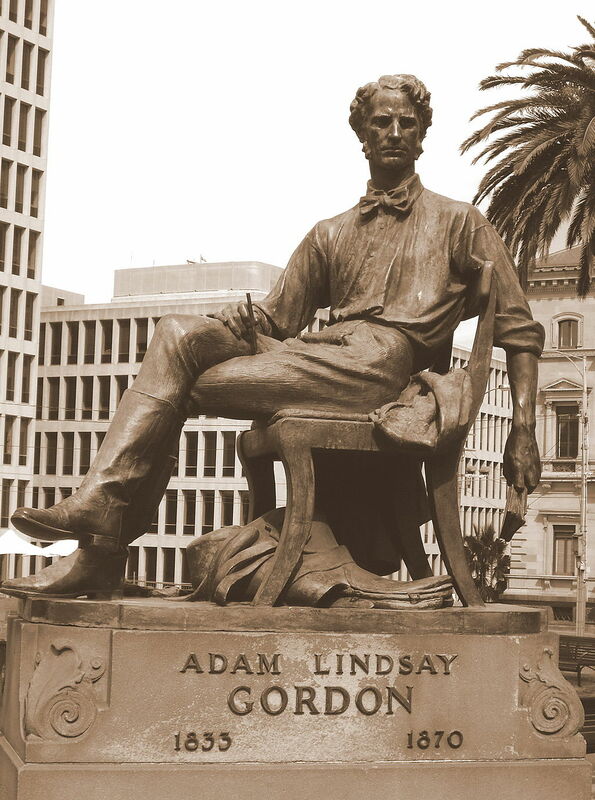 S/he then argues that on Henry Lawson’s death, it was argued that “he was the last of the school which began with Gordon”, but s/he believes that “he was the first of the new school, the Hawthorne of Australian literature”. Does s/he mean Nathaniel Hawthorne? I haven’t heard that before. If young writers seek characters and episodes in the life around them and avoid imitating the style, decadence and false sentiment of the ‘best sellers’, Lawson, Quinn and Kendall will have worthy successors in a field that still has room for exploration. The point of all this for me is that while assessments might vary in the particular, most if not all of the writers mentioned in the articles are still known today – some very well, others in more specialist arenas. It reassures me that Australian literature is deepening, as well as broadening. * Some called it Australasian, some Australian, and others Australian and New Zealand …. Authors’ Week! ** Serle could conceivably be the Catholic Press writer, but I didn’t find any evidence for this. *** Furnley Maurice, I believe. Good and fascinating article that’s given me lots of food for thought here in the UK (for how much longer the UK though?). Ethel M Dell was much read by those in my parents’ and grandparents’ generation. Her novels in fading hardback still turn up in second hand book shops. I’ve never succumbed to one but her wikipedia entry has delightful quotes from writers who reference and mock her, especially PG Wodehouse. But Katherine Mansfield is of this time surely if you’re including new Zealand so there must have been others. Isn’t Henry Handel Richardson included? Oh, thanks for that on Dell, Carol And yes, Mansfield and Richardson did appear in the plebiscite … She was 20th with 47 votes. Poor old Richardson shared last spot with 1 vote. Interesting that most of the commentary I’ve read has tended to focus their discussion on the poets. The rise and fall of writers with fashion … Though “fashion” is not really the right word … Is interesting isn’t it. Richardson’s star has been on the rise in recent times, whereas I’ve never heard of Roy Bridges who was 5th most popular novelist. Yes, I remember Ethel M Dell in my family’s book case – pure escapist reading enjoyed by women enduring the rigours of the years of the Great Depression. Ruby M Ayres was a similar writer – also American, i think. I wonder why Gene Stratton Porter wasn’t mentioned – more widely read than Dell I would have imagined. Thanks LL. Clearly there are people out there who have still heard of Dell! I have no idea of the answer to your question, but I guess the article writers were picking the lightest of popular writers to make their point? Oh my, that first quotation is a beauty, eh? Now I’m interested in Roy Bridges (who for a moment I confused with the novelist Anne Bridges). He sounds sad but must have been very determined too, to produce so much work. We hope to visit Tasmania next year but maybe his novels won’t illuminate our visit? Any advice? Tasmania. Beautiful place. Novels about Tasmania’s history include English writer Matthew Kneale’s The English passengers (one of the very few books by a non-Australian to be shortlisted for the Miles Franklin award). Richard Flanagan is a Tasmanian writer. Tasmanian set books of his include Gould’s book of fish, and Wanting. (Some of his earlier ones were too but I haven’t read them). And then of course Marcus Clarke’s For the term of his natural life is a classic. Favel Parrett’s Past the shallows is also set in Tasmania. I haven’t read it but it was shortlisted for a few awards last year. Have you read any of these? wow speedy response and very helpful. I have 2 of these on my shelves, unread. I gave another to Oxfam trying to be brave and declutter thinking I’d never get round to reading it grr isn’t it always the way. But you’ve set me off with a good list. Thank you so much. I saw the Coast documentary on Tasmania recently and it looks stunningly beautiful. In sort of contrast I’ve read Robert Drewe’s novel The Savage Crows that paints a very bleak picture. PS I’m on a course of reading the first volume of Proust’s In Search of Lost Time for the next couple of months and it’s great. Slow reading highly appropriate in this case. Yes, it is always the way. Sometimes makes you never want to throw anything out but we must eh? Tasmania is a beautiful place. My brother lives there but I don’t get down there often enough. I haven’t read that Drewe novel – in fact I’ve mostly read short stories of his. He’s a great writer. Good for you tackling Proust. I’m not sure I could face that right now. Thanks DKS … I’ve heard of Leakey but not read her. I meant to add to my list two very contemporary works, Favel Parrett’s Past the shallows and When the night comes. Thank you PYKK, I’ve found it and will explore! I’m old enough to cope with the language too. Will let people know what I think anon. Great Carol … Would love you to do that. PS My son has suggested an eco lodge on Tasmania, yes to that. I’d also love to visit Hobart’s galleries, aren’t they world renowned? But time?? Eco lodge where? Cradle Mountain, the Freycinet area, the southwest? So many beautiful places. My next trip will focus on Freycinet at first priority. Hobart has MONA which is definitely world-renowned. I haven’t been there since it opened. (Walsh had an antiquities museum before it). My brother is a historian at the Tasmanian Museum and Art Gallery – it’s not a huge museum but has some great exhibition. But then many towns in Tasmania are museums in themselves. It would be hard not to have a good time there. There is that Hemingway comment that modern American literature really starts with Mark Twain with the implications that the Hawthornes and Poes are really European offshoots. I wonder if Australian literature by 1927 had produced a Twain equivalent with the likes of Banjo Patterson. Of course from a native Australian viewpoint all of Australian literature is simply a branch of European. I know he isn’t everyone’s cup of tea but I once had a copy of Les Murray’s Oxford book of Australian Verse which did seem to try to include examples of Aboriginal writing and produce a much deeper representation of literature in Australia. Good questions Ian … In terms of longevity, Lawson and Paterson would have that place probably in Aussie consciousness. Paterson’s The man from Snowy River, Click go the shears, and Waltzing Matilda are part of our psyches, but I don’t think we’d produced anyone with such a witty and acerbic pen. I like Murray … He was not part of my literary studies as he was just starting to make his name when I was studying. I’ve never done a thorough study of him but I do have two books of his poetry. I love how broad his concerns are … I don’t though have that anthology. Good for him being inclusive. I have a few Aussie anthologies but might look that one up. So Aussie critics can be snarky too I see! I wonder what the critic counts as the start of Australian literature? I mean the U.S. wasn’t actually its own country until officially 1776. Does everything before that count as American literature? Same with Australia, when do you start counting? And do you count the literature of the people that were in the country before the rest of us arrived? I think we both would even if it wasn’t written down. In which case both our countries have a very long and rich literary history! Yes we do … We tend to count white Australian culture from 1788 when the First Fleet arrived but then talk about progression of style and ideas into something homegrown rather than through the prism of England. Our indigenous literary tradition is oral so there is a long tradition as you say but one less known to non-indigenous Aussies. I thought Gene Stratton Porter was American or Canadian, I certainly read and reread her: Laddie, Girl of the Limberlost come to mind. I read Laddie again as a young adult and was shocked at what I’d missed as a child – shades of LP Hartley’s The Go Between. Disillusionment…! Yes she is, Carol… I think LL was referring to any popular writers being read at the time. Zane Grey is American too. I read those and, I think, Freckles too was hers? Loved Girl, and read it to my daughter who now loves it. Now you’ve made me want to read Laddie again. I feel Porter probably had more to her than Dell … At least her books are still published, or Girl is anyhow.